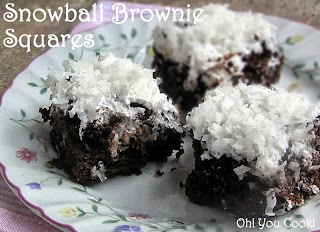 Decadent fudge brownies covered in a coconut and marshmallow creme frosting. I originally planned to totally enrobe these babies in frosting in a kinda sorta homage to Hostess Sno Balls, but my teeth voted against it. My teeth are wise. The frosting shmeared on top and hiding in the middle is quite enough. Preheat oven to 350F. Lightly grease 7 or 8-inch square baking pan with cooking spray. Set aside.